These Ulus are handcrafted by Leroy Barlip III. He was born in Glenallen, Alaska and raised in the Indian village of Gulkana. His Athabascan mother passed along an appreciation for Native art and crafts. His handcrafted ulus combine art and craftsmanship for a beautiful, useful tool. Attached card contains an authenticated Seal of Native Handicraft from Alaska, and is signed by Leroy Barlip. The cutting blades on these Ulus are made from fine steel. They are extremely sharp, and excellent cutting tools. 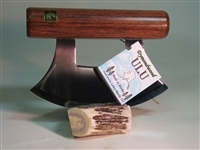 These Ulus are original one-of-a-kind pieces - each one is coded, and when you order, you will receive the actual Ulu in the photograph you order from. 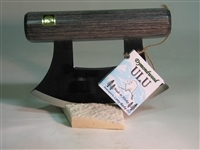 There is no other Ulu like the one you buy. 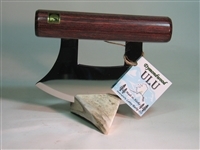 Alaska IVORY Walrus ULU #55-A. Alaskan Moose Antler ULU #60-B. Alaskan Moose Antler ULU #60-C.
Alaskan Moose Antler ULU #60-E.
Alaskan Moose Antler ULU #60-F.
Alaskan Moose Antler ULU #60-G.
IVORY - Fossilized Walrus Ivory ULU #49-A.